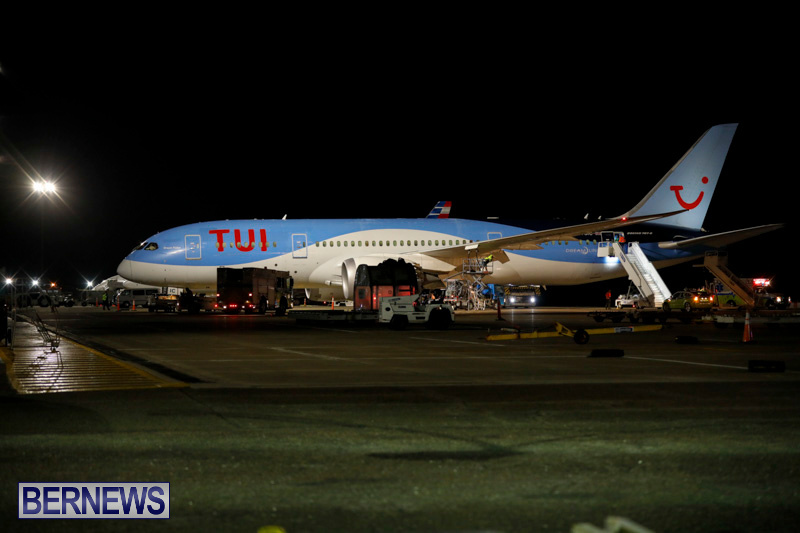 [Updated] A TUI Airplane landed at L.F. Wade International Airport at approximately 12.30am this morning [Dec 13] after diverting to Bermuda for a sick passenger who was transferred to an awaiting ambulance and transported to King Edward Memorial Hospital for treatment. 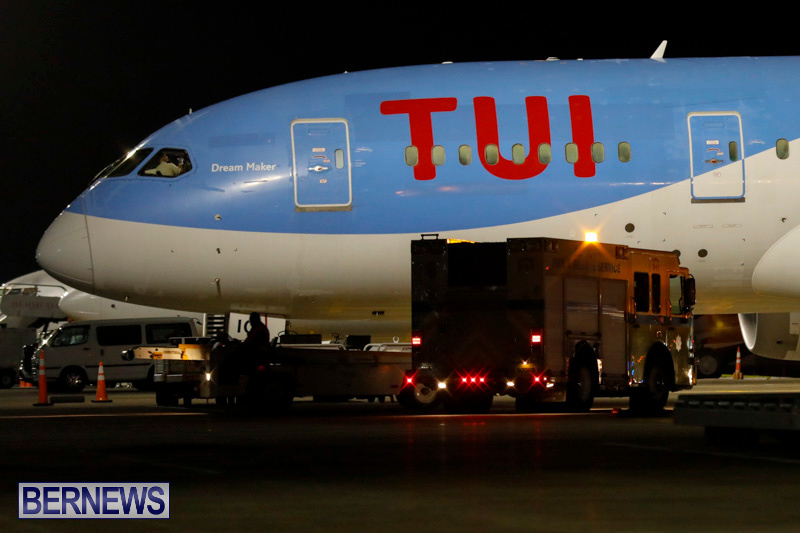 Thomson flight 637 was met at the terminal by Bermuda Fire and Rescue Service personnel and Skyport officials. The airplane, which originally departed from Sangster International Airport in Montego Bay, Jamaica is expected to continue on its journey to Birmingham International Airport in Birmingham, UK. Update 8.03am: The plane stayed overnight with approximately 300 passengers and crew members allowed off the plane and transported to hotels. 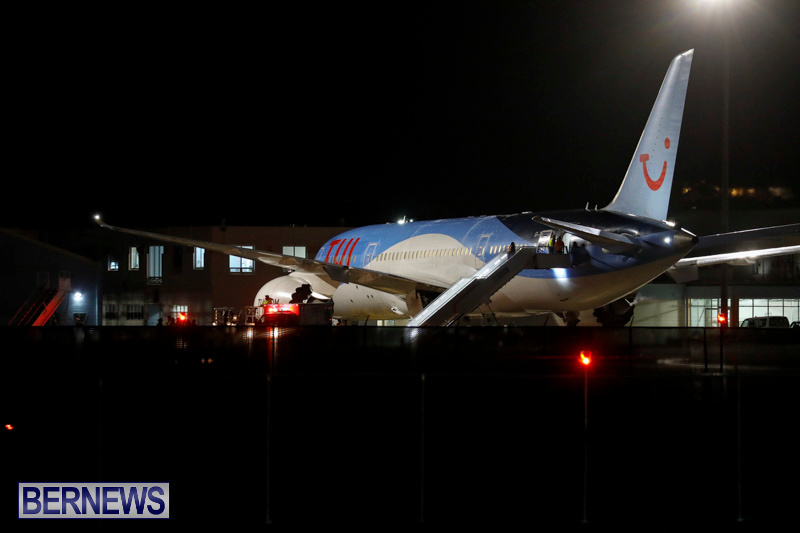 Update 8.06pm: A flight operated by UK- based TUI and originating from Jamaica, made a medical diversion to the Island in the early hours of this morning, Skyport confirmed. The aircraft and passengers ended up staying on island all day after a maintenance issue on the airplane was discovered causing a further delay that ultimately led to the crew timing out. The Boeing 787 aircraft made an unscheduled landing at the LF Wade International Airport on Wednesday morning with 290 passengers and nine crew members on board, including a 56-year-old woman with a medical condition which could not be dealt with in the air. The flight was enroute from Montego Bay to Birmingham, UK. Mikaela Pearman, Marketing & Communications Officer, Bermuda Skyport, said: “The airplane arrived in Bermuda at 12:30am after a female passenger on board reportedly suffered a medical condition that required immediate attention on the ground. The woman, who had to be stabilized, was accompanied by her husband and both were transported to the Kind Edward VII Memorial hospital. Passengers ultimately deplaned at 5:15am and were taken to the Grotto Bay and Fairmont Southampton Princess hotels respectively. The passengers returned to the LF Wade International Airport to commence check in at approximately 2:30 pm. Flight 637, eventually departed the Island for Birmingham at 7:59pm. The female passenger did not board the aircraft back to the UK. biggest mistake Thompson ever made. nobody is interested in that – all that matters right now is that the person and other passengers are okay. stick to what you (think) you know in future. At least Thomson did not skimp on their jets. A beautiful 787 compared to the old beat up 777-200′s BA serves on BDA. Thanks Bernews for showing us what we are missing. This is probably as close as we will get to a Dreamliner 787 in BDA. Thousands pumped into the Bermuda economy because of the unfortunate sickness of a passenger. BTA should look into Bermuda being a one or two day stop over here before it embarks on the reainming trip to JA as a travel package for this airline. I think a German airline does a similar vacation package with JA and than off to Cuba. Put in a claim when you return to UK and if Thompson dosnt cough up they are breaking the law. You didn’t have to pay anything? Everyone got $25 for food! Hardly abandoned. We are still here and are waiting to board the plane.Thank you to all the kind taxi drivers,air port staff,hotel reception staff,waters at the hotel and the Bermudan people for making me feel so welcome.And for not allowing this frustrating situation to become an even bigger ordeal. A short stay,but can I just say Bermuda is a beautiful place.Absolutely stunning views!! Myself and my partner were on the plane. First of all can I say what a beautiful place Bermuda seems to be, if there is one saving grace from this ordeal its the fact I got to see somewhere I would like to come back to. As for the passenger – mmmm nothing confirmed however it wasn’t a straight forward sickness, she had to be restrained for throwing a violent attack on crew and passengers which was drug and/or drink related. To further back this up she was seen in similar states during the entire cruise. I then witnessed her walking off the plane at Bermuda continually saying “sorry” whilst walking down the cabin out of the door! Amazing the size of the butterfly effect one person can have on 300 plus people. TUI will not admit this as it affects the insurance claims that will be a result. As for TUI, biggest mistake they made was not being open and honest in their communications to us. I don’t know about TUI but the biggest mistake you made is passing judgement on a very ill woman, who has suffered a breakdown. How do I know this, because she is a relative of mine. The breakdown was building up on the cruise and became full blown by the time she was on the plane bound for Birmingham. She was hospitalised in Bermuda and flown home with the care of a nurse. If you are ever ‘unfortunate’ enough to be on a plane, again, when someone is having a breakdown and as you are not qualified to diagnose one, may I suggest you keep your thoughts in your tiny brain. And for the record, she is a kind, thoughtful woman who, actually, does not drink and has never done drugs!! Please can you let me know whether this plane was late taking off from Jamaica in the first place? We were disrupted by your plane’s diversion and I’m putting my case together for compensation. Remember the “extraordinary circumstances” of the initial diversion were not the real problem, the “technical problem” was. I was also on this flight the only thing I think they did wrong was they should of kept the woman handcuffed to the seat till we got home. The selfish woman caused all this and I hope she has to pay for her selfishness. Her relative who was on the plane swore blind she doesn’t drink. She was trying to save face saying it was a water infection. Keep your opinions to yourself, Cheryl. Did you know that a water infection can actually kill you. However, my relative has suffered a breakdown, see comment to Marc above. Perhaps all the passengers should thank my relative for suffering a breakdown on the plane, as when it landed a fault was found. Did TUI let you all know if the fault was serious, or not!! You should all pray you got home safe unlike my relative who is poorly, after being hospitalised in Bermuda and flown home with the care of a nurse. I urge people to claim for the delay. I was a passenger waiting for arrival of this plane to take me and my family to Dominican Republic. 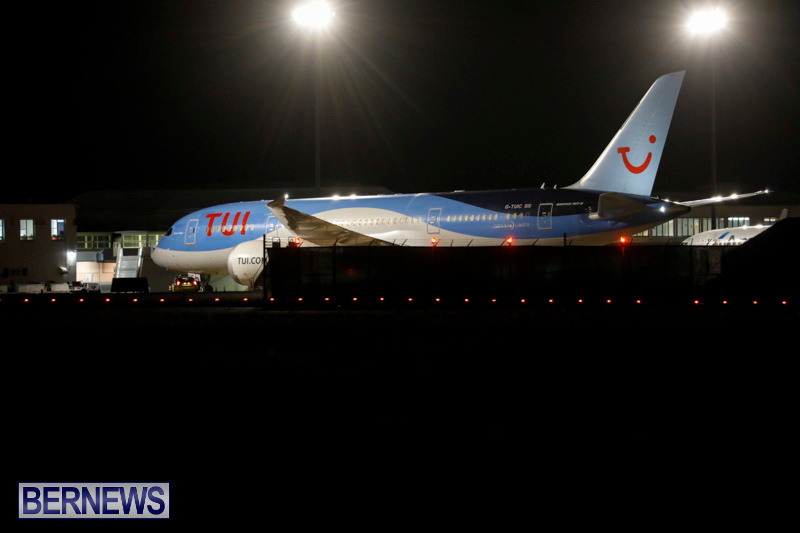 TUI denied compensation for the delay claiming extraordinary circumstances. Took it to the the ombudsman and all 6 of us granted €600 euros each. Shame on TUI for not being honest. The major part of the delay was due to technical issues. Hi,I was on this flight and TUI are not paying out. what ombudsman service did you go through in order to get the compensation please? Has anyone got any compensation yet? MeMe: Great to hear that you’ve got your compensation. Myself and my partner were on the flight a few rows in front of the “scene”. Have been fobbed off by TUI several times (via Resolver) and now escalating to CEDR with the hope of compensation. Are you able to provide any more details of your claim, e.g. the name/web address of the claims company that you used? Thanks MeMe. I’ll see how my claim through the CEDR progresses over the next couple of weeks and go from there. Took a long time and effort but finally the CEDR adjudicator found in my favour so I’m getting my 1,200 Euros compensation back from TUI for the two of us. Happy now.